It was my first time at a Las Vegas Strip pool, and I wasn’t there to swim. I was there for the movies. Reclining in my lounger, nibbling on my hummus, I took it all in: a young couple, holding hands, floating side-by-side on beige-canvas rafts, their eyes trained on the movie screen. A group of women in party dresses, dangling their feet in the water, watching intently. Waitresses in turquoise bikinis delivering drinks and picnic baskets to moviegoers enjoying the agreeable evening air. TropFest—named after the Tropicana Cafe in Sydney, Australia—couldn’t have had a better Las Vegas launch. 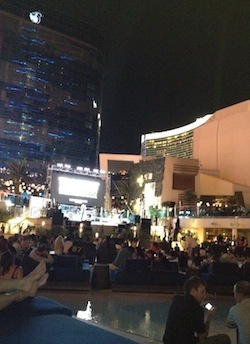 An international festival designed for low-budget shorts, organizers chose the Cosmopolitan Las Vegas for the debut of the “All-Star Competition,” featuring the “best of” TropFest entries from recent years, including prize-winning films from the Asian, European, and Australian festivals. Celebrity judges included James Woods and Tobey McGuire. Rules stipulate that entries have to be less than 7-minutes long and premiere at Tropfest with the annual “signature” item. (One year it was a gherkin; this year, a lightbulb.) Beyond that, the field was what’s-up-next wide open—everything from nail-biting action to reality-TV spoof to music-video animation. Since there was no clear-cut gem, the only way to anticipate the Vegas winner was to rule out the films with flaws. While a large woman in an apricot swimdress lowered herself into the deep end, I easily cut Fish Lips from my list. A festival contender about a Yachtzee Game gone awry, the film was suited to a longer format so that the audience would have a better grasp of the motivations of the trio of misfit tweenies, particularly the bulbous-faced kid who swallowed the dice. Ditto Lemonaid Stand, which layered-on cartoon stills to quickly condense a quirky neighbor-from-hell conflict that would have perhaps been better served by gradual development. The fact that Lemonaid Stand was directed by Australian favorite Alethea Jones and won first prize at the 2012 Australia TropFest raises the issue of how regional tastes and loyalties influence judging. I noted that the New York TropFest had chosen its own, too. The 2008 first prize winner Jason Van Genderen’s Mankind Is No Island was shot on a cellphone for $50.00. An elegant, literary work with an edgy, urban feel, Mankind weaves together image and signage in New York and Sydney to make a moving statement about the isolated poor in inner cities. The trio of college kids on the loungers next to me gave it an approving roar. I decided that Vegas, the permissive city, would choose The Switch by Jonathan Emmerling, in which a man who can’t find a girl receives an offer from an eligible guy. Instead, Vegas, the gambling Mecca, chose a film about risk. The Story of Bubble Boy by Sean Ashcroft took the prize for a coming-of-age parable about the necessity of living fearlessly in the world. While the tourists on the Strip—swarming the sidewalks, shuttling in cabs and crowding into the casinos—were visible through the glass sound-proofing several stories below, they were worlds away from the mostly local clientele at the Cosmopolitan’s West Boulevard Pool. No cover charge, no fee. As the nearly full moon hovered in the sky over the shiny hotel and apartment towers, I ordered another Paul Jaboulet Ainé Côtes de Rhone and felt glad I live here. This entry was posted in Culture and tagged art, bikini, casino, city, Cosmopolitan, cover charge, festival, film, food, gherkin, international, James Woods, judging, locals, Mecca, movies, New York, parable, pool, risk, Strip, Sydney, Tobey McGuire, tourists, Tropicana, Vegas, video, waitress, winner, Yachtzee. Bookmark the permalink.